In 2008, my IT coworkers got me to compete in a barbecue contest as a Bucket List stretch goal. Since that win, I’ve been on an amazing international journey of barbecue exploration and travels. 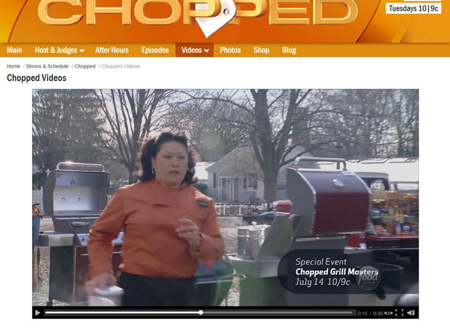 One bucket list item I still wanted to accomplish was to cook on my favorite TV show Chopped on the Food Network. I’ve watched this show, off and on, since its debut in 2009. In each episode, four chefs compete in a mystery basket ingredient contest (typically 4 ingredients but sometimes 5). One chef gets chopped in the 20-minute appetizer round, one in the 30-minute main course, and the final two battle the 30-minute dessert round to decide the winner. Each chef must use all ingredients in the basket and using an ingredient without transforming it is frowned upon by the 3 celebrity judges who can be very tough and critical. I’m amazed and appalled to see seasoned chefs with heavy duty culinary backgrounds and decades of experience melt down on Chopped. I’ve often wondered how an IT nerd like me who works in a fabric covered cubicle in a Dilbertesque existence in downtown LA might fare in such a contest. I may know how to cook a decent competition brisket but I have 24 hours. But, in 30 minutes, no way! The plus side was that I was so happy to see my good friends, the husband-and-wife pitmasters, Tommy and Jennifer Duncan being featured on the show as dueling couples. Since my fiancé Donna Fong of Butchers Daughter BBQ is also a grand champion pitmaster, I wondered how the two of us might have fared on the first Chopped Grill Masters as both Tommy and Jennifer did not make the final $50,000 round. Roll the tape forward to 2015 as Donna and I get our chance to be on the second Chopped Grill Masters. This time, I’m sure as hell not going to blurt out, “You can’t cook barbecue in 30 minutes!” Here’s our 11-part story of our Chopped Grill Masters adventure. 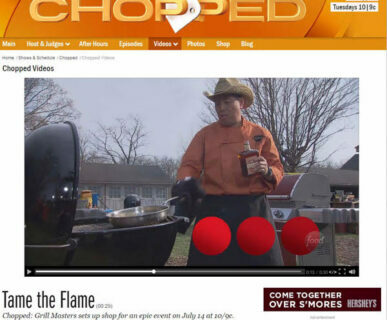 My journey to Food Network’s Chopped Grill Masters began purely by accident. There was no ambition, nor hope. Sorta like how I fell in love with Harry; by accident. We rarely choose the people we love. If it was intentional, we’d walk towards love rather than fall into it. A hole opens in the ground and we are consumed. My 10 year old daughter, Miranda, and I had been encouraging Harry to apply to Food Network’s cooking game show called Chopped. We watched the show with as much faith as we did professional baseball or basketball. In our opinion, he was the perfect competitor. Harry is a terrific cook with a broad scope of experience. He can cook many cuisines and is wildly creative. Just look at his recipes on SlapYoDaddyBBQ.com. His rhythm in most things is speedy. I feel lethargic in comparison; my methodical need to be perfect slows each step. Plus, Harry is good at sweet talk; convincing people that they are just about to eat the best BBQ of their lives. Most of the time, he’s right. He is a winning competitor. We prodded him enough one Sunday night to get him to apply online before driving us to the airport. Airports are part of our regular journey back and forth to Alameda. By Monday morning, a casting producer had called Harry, asking for an interview over Skype. Harry shines in these situations: luxuriating in front of a camera like a turtle under a heat lamp. The next Friday, I flew back down to LA to help Harry teach a BBQ class in his home. He picked me up at the Ontario airport and on our way to Diamond Bar, he mentions that Chopped Grill Masters called him again. During his call with the casting producer, she expressed an interest in “selling” us as a competitive BBQ couple to the executive producer. There was a precedent to this idea. Two years prior, our friends, Jennifer and Tommy Duncan were the BBQ couple on the first series filmed in Arizona. He stared straight ahead and then off in the distance as he asked me to think about appearing in Chopped. He tried not to seem too invested, knowing good and well that I never liked the camera or any public attention. He didn’t think I would ever go for it. I silently cussed in my head. Harry’s chances to get on the show now rested in my willingness to be on national TV. If I declined, I lessened the likelihood that he would get on the show. And it would be good for business to be on the show. Mind you, I only cook once or twice a week for my daughter and when I did, it was nearly always the same thing, fish with veggies and potatoes. The rest of the time, my mother cooked a Cantonese dinner on Mondays and Thursdays, or we went out for dinner. I was screwed. I had neither the natural talent nor the skill set that even a normal home cook would have had by the age of 47. And no matter how well I have eaten in my lifetime, it didn’t make up for the lack in cooking skills. No mention of Chopped was made again that weekend. We cooked. We taught. We cleaned and distributed leftover class meat. A few days more and I would share with Harry that I’d join him on his journey despite my reservation to be in front of the camera. I didn’t want to be responsible for reducing his chances of getting on the show, nor did I want to disappoint my daughter who wanted to meet our living room culinary heroes, the stars of our favorite TV show. Chances were good that I’d be exiting first but better to have tried than not at all. I was only risking public humiliation on a national level. Great, just great; just what I always wanted. Oh no, Harry, you may have created a monster. It is now inevitable that Donna will soon be followed by paparazzi everywhere she goes. TMZ will be showing hidden camera footage of you two while going shopping at the grocery store. Miranda will been seen carrying a tiny chihuahua in her purse, just like all the best celebrities. You are right Scott. As Donna put it that Harry is like a turtle luxuriating under a heat lamp, Donna will be like a slug recoiling from salt! LOL! You guys are both outstanding as grill masters and your wonderful people and that fact alone the camera will love you both. I would not be a bit surprised to see either one of you win this show and in fact I know you’ll win. Go have fun and just be you and deliver like you have done for years and it’s a SLAM DUNK! Thanks Mike for the support. With over 80 hours of footage cut into a 1-hour show, who knows how the final portrayal. War of the Roses, perhaps? It was hella fun to be on the show. The Food Network crew were friendly, professional, and treated us very well.